1. Slice the heavy skin of the vegetable with a knife, discard and cut the pulp into medium cubes. 2. Blend rice powder with coconut and green chillies into a fine paste. 3. Heat 1/2 cup of water with salt and cook the vegetable for 5 to 6 minutes until soft and done. 4. Heat oil in a non-stick pan and pop the mustard seeds. 5. Remove from flame, wet crush and stir in the curry leaves. 6. Add popped mustard, cooked vegetable and the paste to the yogurt and cook over a low flame for 2 minutes until it comes to boil. 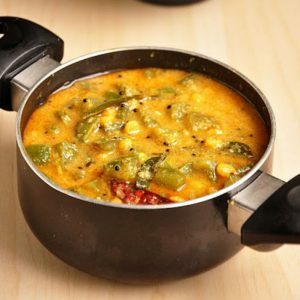 Feel free to comment or share your thoughts on this Pooshinikkai Mor Kootu Recipe from Awesome Cuisine.